A marriage contract, containing among other things the settlement on the wife of a certain amount payable at her husband's death or on her being divorced. This institution was established by the Rabbis in order to put a check on freedom of divorce, to obtain which no consent is required on the part of the woman (see Divorce). Some of the rabbis considered the ketubah of a virgin to be of Mosaic origin (Yeb. 89a; Ket. 10a; Tos. s.v. "Amar"; comp. Tobit vii. 14). The minimum amount payable under a ketubah was 200 zuz (a zuz = about 15 cents) for virgins, and 100 zuz for women who were not virgins at marriage; the priests and the noble families of Jerusalem doubled these sums (Ket. 12a). The amount could be increased by the husband and mentioned either in the ketubah itself or in a special deed (Tosafot Ketubah; Ket. 54b; Shulḥan 'Aruk, Eben ha-'Ezer, 66, 7). Besides these items, the ketubah mentioned also the amount of the dowry and the addition thereto made by the husband (the custom at present is to add 100 per cent to the amount of the dowry), as well as the ordinary obligations of a husband to his wife. "On . . . [day of the week], the . . . day of the month . . . in the year . . . since the creation of the world, the era according to which we are accustomed to reckon here in the city of . . . how . . . son of . . . said to this virgin . . . daughter of . . . 'Be thou my wife according to the law of Moses and Israel, and I will work for thee, honor, support, and maintain thee in accordance with the custom of Jewish husbands who work for their wives, honor, support, and maintain them in truth. And I will set aside for thee 200 zuz, in lieu of thy virginity, which belong to thee (according to the law of Moses), and thy food, clothing, and necessaries, and live with thee in conjugal relations according to universal custom.' And . . . this virgin consented and became his wife. The dowry that she brought from her father's house, in silver, gold, valuables, dresses, and bedclothes, amounts to . . . [100 silver pieces], and . . . the bridegroom consented to increase this amount from his own property with the sum of . . . [100 silver pieces], making in all . . . [200 silver pieces]. And thus said . . . the bridegroom, 'I take upon myself and my heirs after me the responsibility of this marriage contract, of the dowry, and of the additional sum, so that all this shall be paid from the best part of my property, real and personal, that I now possess or may hereafter acquire. All my property, even the mantle on my shoulders, shall be mortgaged for the security of this contract and of the dowry and of the addition made thereto.' . . . the bridegroom has taken upon himself the responsibility for all the obligations of this ketubah, as is customary with other ketubot made for the daughters of Israel in accordance with the institution of our sages—may their memory be for a blessing! It is not to be regarded as an illusory obligation or as a mere form of document. We have followed the legal formality of symbolical delivery ["ḳinyan"] between . . . son of. . . , the bridegroom, and . . . daughter of . . . , this virgin, and have employed an instrument legally fit for the purpose to strengthen all that is stated above, and everything is valid and established. Thus the ketubah formed a lien upon all real estate owned by the husband during his lifetime, and if at his death, or when he divorced his wife, he possessed no estate, it could be collected out of any property he had sold or gifted since the ketubah had been written (Giṭ. 48b, 55b; Eben ha-'Ezer, 100, 3). This, however, was not originally the case; and it was only after a series of changes, tending toward the restriction of arbitrary divorce, that this became the rule. 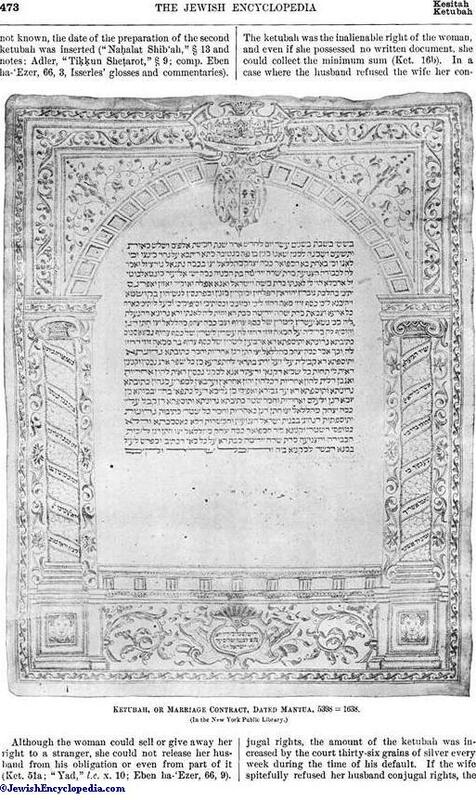 At first the marriage settlement was deposited with the wife's father; then it was converted into some valuable household utensil, of which the husband also could make use, and entrusted to the wife; and when this regulation also was found unsatisfactory, Simeon b. Sheṭaḥ ordained that the amount of the ketubah should remain with the husband, but become a lien on his property (Ket. 82b; Tosef., Ket. xii. 1; comp. commentaries ad loc.). The Geonim still further strengthened the security of the ketubah by making his personal estate also liable for the ketubah ("Yad," Ishut, xvi. 7; "Maggid Mishneh," ad loc. ; Eben ha'Ezer, 100, 1). There could be no conjugal relations between husband and wife before the ketubah was prepared, or if it contained a sum less than that stipulated by the Rabbis (Ket. 54b). If the ketubah was lost, a new one had to be written. In such a case, the document to replace the lost one ( ) was drawn up by two (according to some authorities, three) witnesses, constituting a court, who were required to sign the document and to record the fact that the original ketubah was lost and that the husband had asked them to write another. If the date of the first ketubah was known, the same date had to be given in the second document; but if it wasnot known, the date of the preparation of the second ketubah was inserted ("Naḥalat Shib'ah," § 13 and notes; Adler, "Tiḳḳun Sheṭarot," § 9; comp. Eben ha-'Ezer, 66, 3, Isserles' glosses and commentaries). 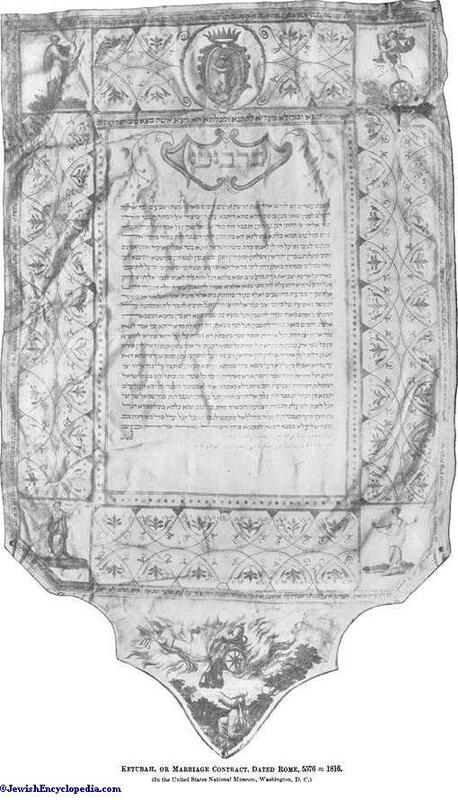 Ketubah, or Marriage Contract, Dated Mantua, 5398 = 1638. Although the woman could sell or give away her right to a stranger, she could not release her husband from his obligation or even from part of it (Ket. 51a; "Yad," l.c. x. 10; Eben ha-'Ezer, 66, 9). 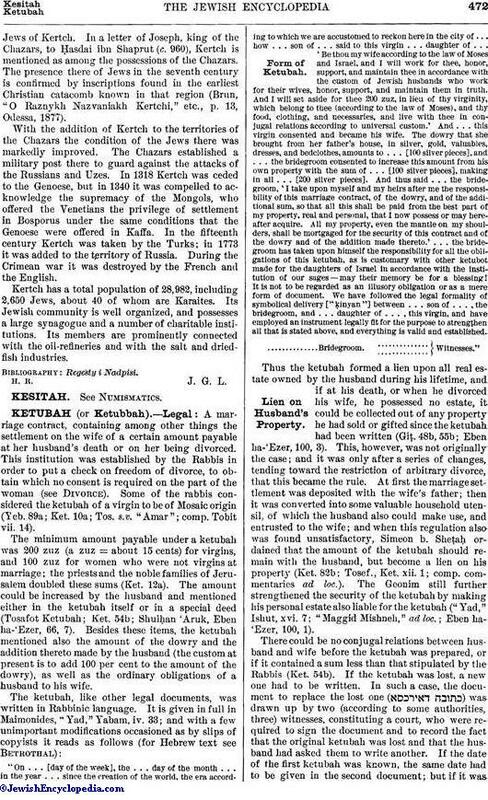 The ketubah was the inalienable right of the woman, and even if she possessed no written document, she could collect the minimum sum (Ket. 16b). In a case where the husband refused the wife her conjugal rights, the amount of the ketubah was increased by the court thirty-six grains of silver every week during the time of his default. 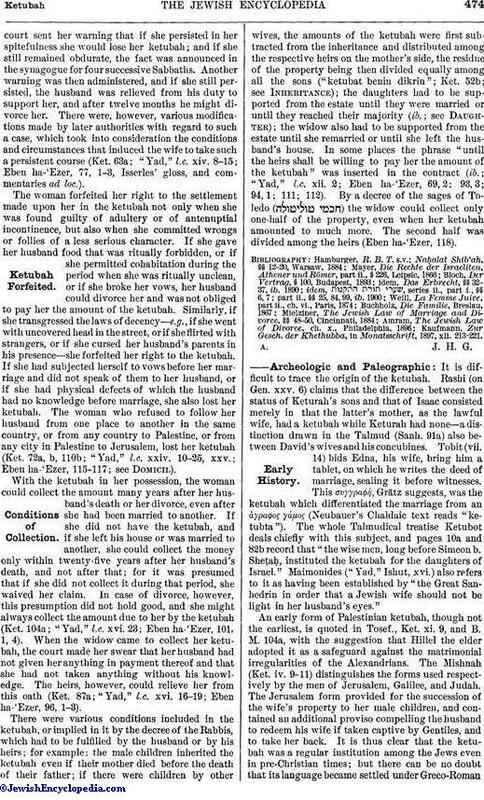 If the wife spitefully refused her husband conjugal rights, thecourt sent her warning that if she persisted in her spitefulness she would lose her ketubah; and if she still remained obdurate, the fact was announced in the synagogue for four successive Sabbaths. Another warning was then administered, and if she still persisted, the husband was relieved from his duty to support her, and after twelve months he might divorce her. There were, however, various modifications made by later authorities with regard to such a case, which took into consideration the conditions and circumstances that induced the wife to take such a persistent course (Ket. 63a; "Yad," l.c. xiv. 8-15; Eben ha-'Ezer, 77, 1-3, Isserles' gloss, and commentaries ad loc.). The woman forfeited her right to the settlement made upon her in the ketubah not only when she was found guilty of adultery or of antenuptial incontinence, but also when she committed wrongs or follies of a less serious character. If she gave her husband food that was ritually forbidden, or if she permitted cohabitation during the period when she was ritually unclean, or if she broke her vows, her husband could divorce her and was not obliged to pay her the amount of the ketubah. Similarly, if she transgressed the laws of decency—e.g., if she went with uncovered head in the street, or if she flirted with strangers, or if she cursed her husband's parents in his presence—she forfeited her right to the ketubah. If she had subjected herself to vows before her marriage and did not speak of them to her husband, or if she had physical defects of which the husband had no knowledge before marriage, she also lost her ketubah. The woman who refused to follow her husband from one place to another in the same country, or from any country to Palestine, or from any city in Palestine to Jerusalem, lost her ketubah (Ket. 72a, b, 110b; "Yad," l.c. xxiv. 10-25, xxv. ; Eben ha-'Ezer, 115-117; see Domicil). With the ketubah in her possession, the woman could collect the amount many years after her husband's death or her divorce, even after she had been married to another. If she did not have the ketubah, and if she left his house or was married to another, she could collect the money only within twenty-five years after her husband's death, and not after that; for it was presumed that if she did not collect it during that period, she waived her claim. In case of divorce, however, this presumption did not hold good, and she might always collect the amount due to her by the ketubah (Ket. 104a; "Yad," l.c. xvi. 23; Eben ha-'Ezer, 101, 1, 4). When the widow came to collect her ketubah, the court made her swear that her husband had not given her anything in payment thereof and that she had not taken anything without his knowledge. The heirs, however, could relieve her from this oath (Ket. 87a; "Yad," l.c. xvi. 16-19; Eben ha-'Ezer, 96, 1-3). There were various conditions included in the ketubah, or implied in it by the decree of the Rabbis, which had to be fulfilled by the husband or by his heirs; for example: the male children inherited the ketubah even if their mother died before the death of their father; if there were children by other wives, the amounts of the ketubah were first subtracted from the inheritance and distributed among the respective heirs on the mother's side, the residue of the property being then divided equally among all the sons ("ketubat benin dikrin"; Ket. 52b; see Inheritance); the daughters had to be supported from the estate until they were married or until they reached their majority (ib. ; see Daughter); the widow also had to be supported from the estate until she remarried or until she left the husband's house. In some places the phrase "until the heirs shall be willing to pay her the amount of the ketubah" was inserted in the contract (ib. ; "Yad," l.c. xii. 2; Eben ha-'Ezer, 69, 2; 93, 3; 94, 1; 111; 112). 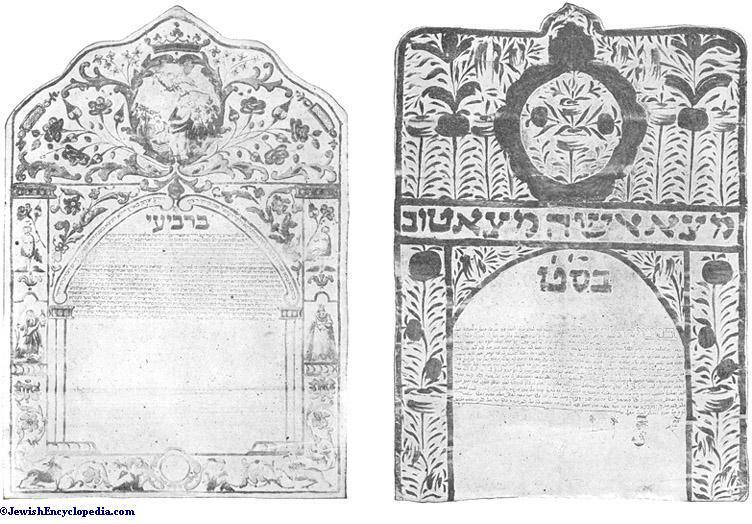 By a decree of the sages of Toledo ( ) the widow could collect only one-half of the property, even when her ketubah amounted to much more. The second half was divided among the heirs (Eben ha-'Ezer, 118). Kaufmann, Zur Gesch. der Khethubba, in Monatsschrift, 1897, xli. 213-221. 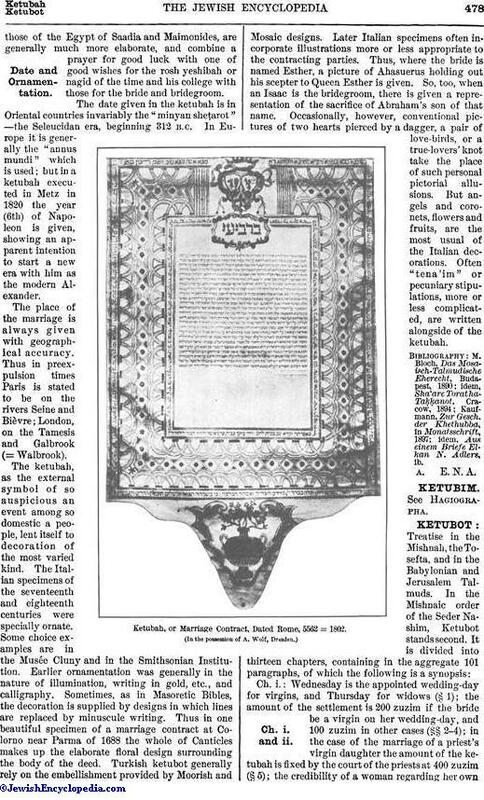 It is difficult to trace the origin of the ketubah. Rashi (on Gen. xxv. 6) claims that the difference between the status of Keturah's sons and that of Isaac consisted merely in that the latter's mother, as the lawful wife, had a ketubah while Keturah had none—a distinction drawn in the Talmud (Sanh. 91a) also between David's wives and his concubines. Tobit (vii. 14) bids Edna, his wife, bring him a tablet, on which he writes the deed of marriage, sealing it before witnesses. 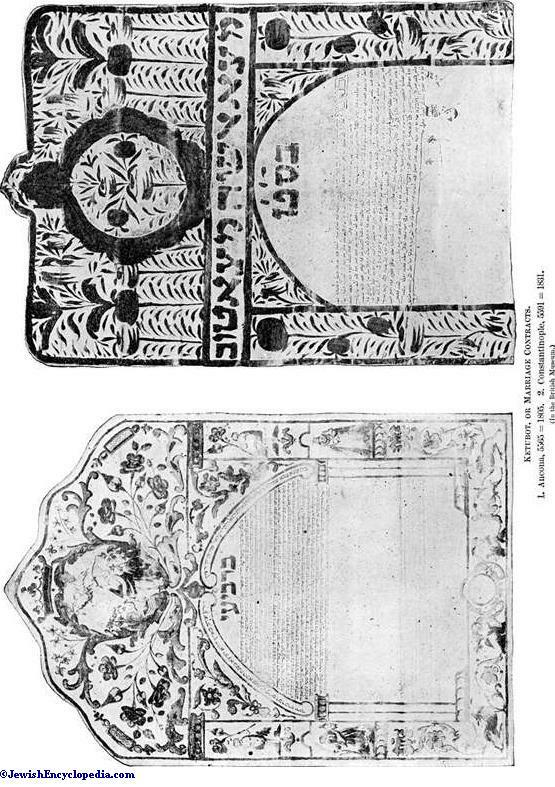 This συγγραφή, Grätz suggests, was the ketubah which differentiated the marriage from an αγραΦος γάμος (Neubauer's Chaldaic text reads "ketubta"). The whole Talmudical treatise Ketubot deals chiefly with this subject, and pages 10a and 82b record that "the wise men, long before Simeon b. Sheṭaḥ, instituted the ketubah for the daughters of Israel." Maimonides ("Yad," Ishut, xvi.) also refers to it as having been established by "the Great Sanhedrin in order that a Jewish wife should not be light in her husband's eyes." 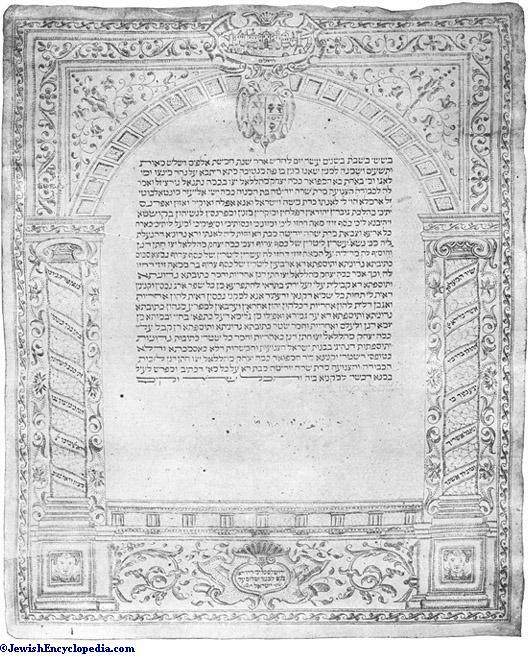 Ketubah, or Marriage Contract, Dated Rome, 5576 = 1816. 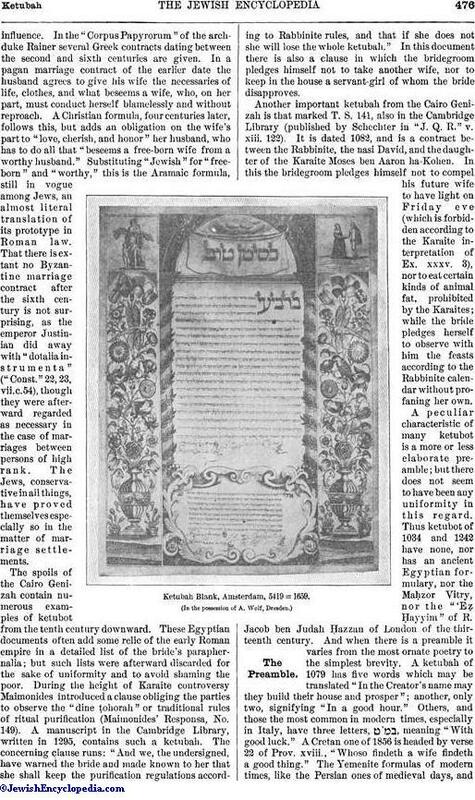 An early form of Palestinian ketubah, though not the earliest, is quoted in Tosef., Ket. xi. 9, and B. M. 104a, with the suggestion that Hillel the elder adopted it as a safeguard against the matrimonial irregularities of the Alexandrians. The Mishnah (Ket. iv. 9-11) distinguishes the forms used respectively by the men of Jerusalem, Galilee, and Judah. The Jerusalem form provided for the succession of the wife's property to her male children, and contained an additional proviso compelling the husband to redeem his wife if taken captive by Gentiles, and to take her back. It is thus clear that the ketubah was a regular institution among the Jews even in pre-Christian times; but there can be no doubt that its language became settled under Greco-Roman influence. In the "Corpus Papyrorum" of the archduke Rainer several Greek contracts dating between the second and sixth centuries are given. In a pagan marriage contract of the earlier date the husband agrees to give his wife the necessaries of life, clothes, and what beseems a wife, who, on her part, must conduct herself blamelessly and without reproach. A Christian formula, four centuries later, follows this, but adds an obligation on the wife's part to "love, cherish, and honor" her husband, who has to do all that "beseems a free-born wife from a worthy husband." Substituting "Jewish" for "free-born" and "worthy," this is the Aramaic formula, still in vogue among Jews, an almost literal translation of its prototype in Roman law. That there is extant no Byzantine marriage contract after the sixth century is not surprising, as the emperor Justinian did away with "dotalia instrumenta" ("Const." 22, 23, vii. c. 54), though they were afterward regarded as necessary in the case of marriages between persons of high rank. The Jews, conservative in all things, have proved themselves especially so in the matter of marriage settlements. The spoils of the Cairo Genizah contain numerous examples of ketubot from the tenth century downward. These Egyptian documents often add some relic of the early Roman empire in a detailed list of the bride's paraphernalia; but such lists were afterward discarded for the sake of uniformity and to avoid shaming the poor. During the height of Karaite controversy Maimonides introduced a clause obliging the parties to observe the "dine ṭohorah" or traditional rules of ritual purification (Maimonides' Responsa, No. 149). A manuscript in the Cambridge Library, written in 1295, contains such a ketubah. The concerning clause runs: "And we, the undersigned, have warned the bride and made known to her that she shall keep the purification regulations according to Rabbinite rules, and that if she does not she will lose the whole ketubah." In this document there is also a clause in which the bridegroom pledges himself not to take another wife, nor to keep in the house a servant-girl of whom the bride disapproves. Another important ketubah from the Cairo Genizah is that marked T. S. 141, also in the Cambridge Library (published by Schechter in "J. Q. R." v. xiii. 122). It is dated 1082, and is a contract between the Rabbinite, the nasi David, and the daughter of the Karaite Moses ben Aaron ha-Kohen. In this the bridegroom pledges himself not to compel his future wife to have light on Friday eve (which is forbidden according to the Karaite interpretation of Ex. xxxv. 3), nor to eat certain kinds of animal fat, prohibited by the Karaites; while the bride pledges herself to observe with him the feasts according to the Rabbinite calendar without profaning her own. A peculiar characteristic of many ketubot is a more or less elaborate preamble; but there does not seem to have been any uniformity in this regard. Thus ketubot of 1034 and 1242 have none, nor has an ancient Egyptian formulary, nor the Maḥzor Vitry, nor the "'Eẓ Ḥayyim" of R. Jacob ben Judah Ḥazzan of London of the thirteenth century. And when there is a preamble it varies from the most ornate poetry to the simplest brevity. A ketubah of 1079 has five words which may be translated "In the Creator's name may they build their house and prosper"; another, only two, signifying "In a good hour." Others, and those the most common in modern times, especially in Italy, have three letters, , meaning "With good luck." 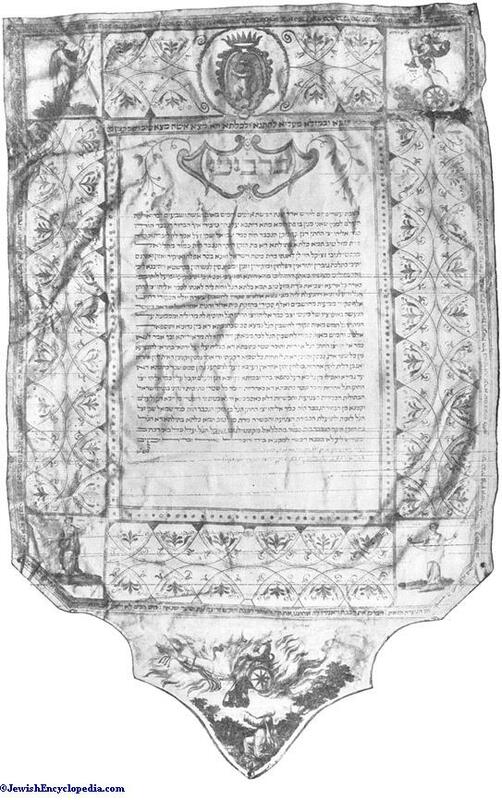 Ketubah Blank, Amsterdam, 5419 = 1659. (In the possession of A. Wolf, Dresden. )Date and Ornamentation. 1. Ancona, 5565 = 1805. 2. Constantinople, 5591 = 1831. A Cretan one of 1856 is headed by verse 22 of Prov. xviii., "Whoso findeth a wife findeth a good thing." The Yemenite formulas of modern times, like the Persian ones of medieval days, and those of the Egypt of Saadia and Maimonides, are generally much more elaborate, and combine a prayer for good luck with one of good wishes for the rosh yeshibah or nagid of the time and his college with those for the bride and bridegroom. The date given in the ketubah is in Oriental countries invariably the "minyan sheṭarot"—the Seleucidan era, beginning 312, B.C. In Europe it is generally the "annus mundi" which is used; but in a ketubah executed in Metz in 1820 the year (6th) of Napoleon is given, showing an apparent intention to start a new era with him as the modern Alexander. The place of the marriage is always given with geographical accuracy. Thus in preexpulsion times Paris is stated to be on the rivers Seine and Bièvre; London, on the Tamesis and Galbrook (= Walbrook). 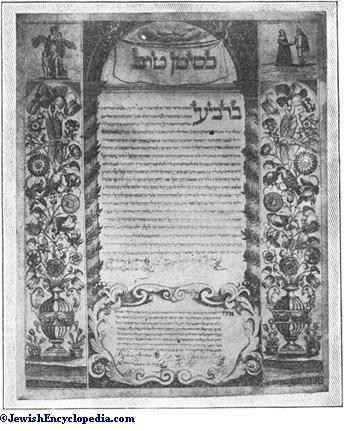 The ketubah, as the external symbol of so auspicious an event among so domestic a people, lent itself to decoration of the most varied kind. The Italian specimens of the seventeenth and eighteenth centuries were specially ornate. Some choice examples are in the Musée Cluny and in the Smithsonian Institution. Earlier ornamentation was generally in the nature of illumination, writing in gold, etc., and calligraphy. Sometimes, as in Masoretic Bibles, the decoration is supplied by designs in which lines are replaced by minuscule writing. Thus in one beautiful specimen of a marriage contract at Colorno near Parma of 1688 the whole of Canticles makes up the elaborate floral design surrounding the body of the deed. Turkish ketubot generally rely on the embellishment provided by Moorish and Mosaic designs. Later Italian specimens often incorporate illustrations more or less appropriate to the contracting parties. Thus, where the bride is named Esther, a picture of Ahasuerus holding out his scepter to Queen Esther is given. So, too, when an Isaac is the bridegroom, there is given a representation of the sacrifice of Abraham's son of that name. Occasionally, however, conventional pictures of two hearts pierced by a dagger, a pair of love-birds, or a true-lovers' knot take the place of such personal pictorial allusions. But angels and coronets, flowers and fruits, are the most usual of the Italian decorations. Often "tena'im" or pecuniary stipulations, more or less complicated, are written alongside of the ketubah. idem, Aus einem Briefe Elkan N. Adlers, ib.